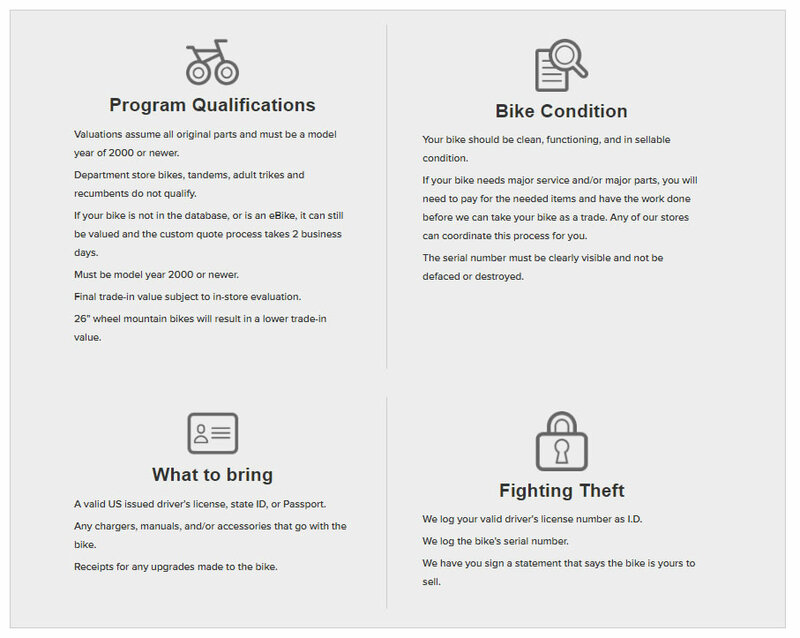 The Bicycle BlueBook Trade In bicycle program is a fast and simple way to trade in your used bicycle and apply the credit toward the purchase of a new bike at Solon Bicycle. Follow the simple process and you can be out riding your new bike in no time. Your old bike may be worth more than you think! Bring your bike to our store for a full evaluation and offer. If you accept the offer, this amount will be applied as a credit towards the purchase of your new bike or loaded onto a Solon Bicycle gift card. Please clean your bike before bringing in! PLEASE NOTE - Only 1 bike may be traded-in per new bike purchase. If you have multiple bikes to trade, a gift card will be issued per additional bike. Final appraised value will be determined in-store after confirming bike condition.